For the past dozen years, the American elite has pursued a relentless agenda of “education reform,” which has aimed to privatize large sections of the education system and drastically weaken the strength of the teacher unions. The recent negotiations for a new contract for 110,000 education workers in the United Federation of Teachers (UFT) in New York City was an important opportunity to push back against these relentless attacks. But unfortunately this opportunity was missed when the leadership of the union came back from negotiations with a 9 year austerity contract, which a demoralized membership largely accepted. This setback has real negative consequences for the teachers’ unions nationally and for other municipal unions in New York City. New York City’s new Mayor Bill de Blasio ran under the banner of addressing inequality as he described New York as a “tale of two cities,” rife with inequalities in housing, early childhood education and police tactics” (“De Blasio Asks City to Address Its Inequalities,” By Michael Barbaro. New York Times 5 Aug 2013). Furthermore, he sold himself as a friend to the unions. Almost the entire municipal workforce of 350,000 were working under expired contracts while de Blasio’s predecessor Bloomberg, a notorious anti-union mayor, was in office. De Blasio also promised a serious change in education policy from that of Bloomberg, who had been one of the top education “deformers” in the U.S. Bloomberg pretended he cared about the fate of working class and poor children. But the net result of his policies, as described succinctly in a recent New York Times headline, is that “Public Schools in New York City Are Poorer and More Crowded” (2 July 2014). In order to contrast himself with this image, De Blasio quickly appointed Carmen Fariña, a former teacher, principal, and district superintendent, as the Chancellor of the Department of Education (DoE). 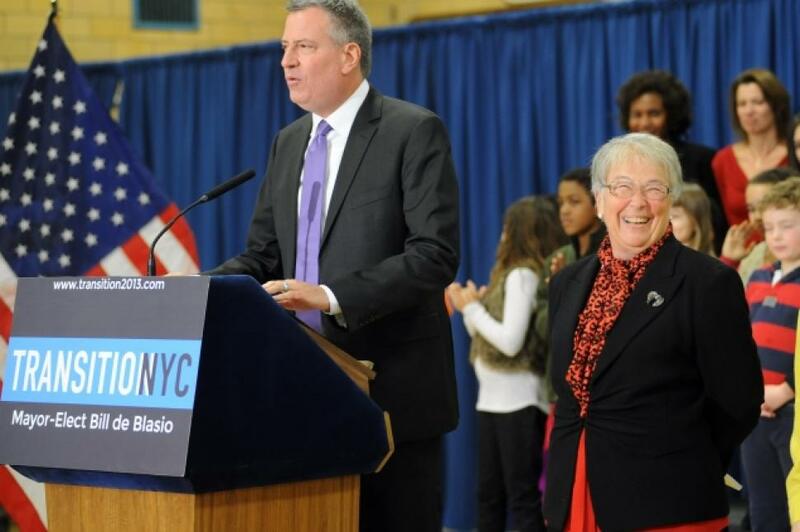 This looked to teachers, like a hopeful development, as Fariña promised to fight alongside de Blasio against high-stakes testing for universal pre-K, funded by taxing the wealthy, and for more arts programs in city public schools. 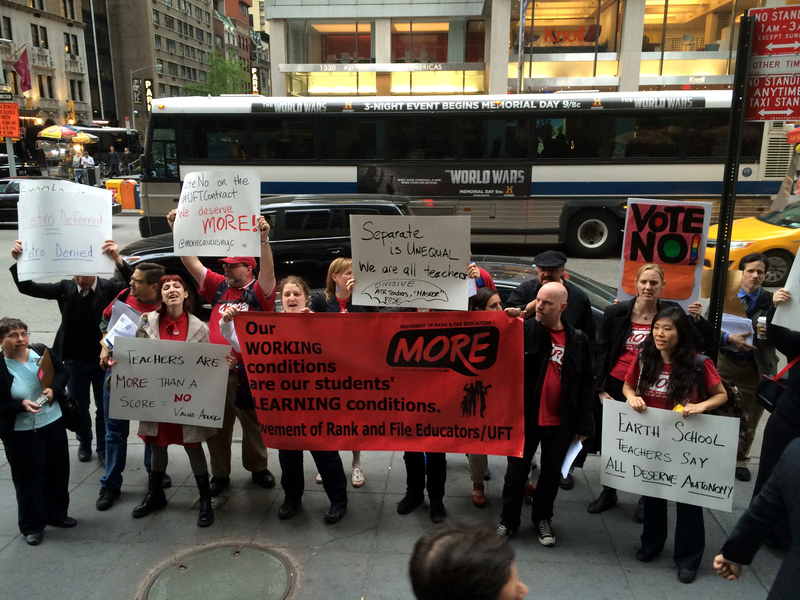 De Blasio and Fariña said they were also against charter co-locations, and school closings. 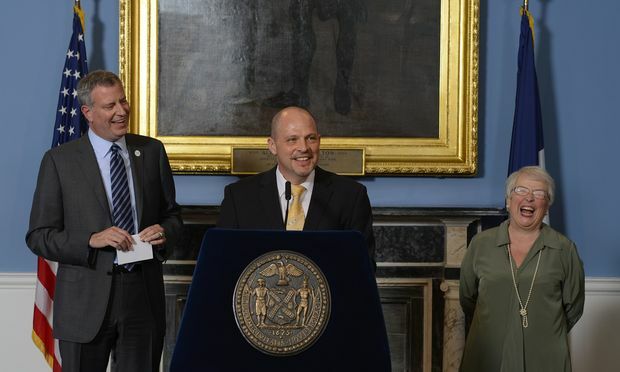 However, a month after de Blasio’s inauguration, he “approved 36 charter schools to share space with other schools” (“Bill de Blasio Is Actually More Helpful To Charter Schools Than Some Republicans, Report Says” [The Huffington Post 7 Apr 2014]). Carmen Fariña, not surprisingly, did not utter a word of protest. Like de Blasio, UFT President Michael Mulgrew and the UFT leadership’s dominant Unity Caucus has a poor history of fighting against the privatization represented by charter schools and the use of standardized testing in New York City. The UFT leadership has yet to attempt a mobilization of the membership against charter schools’ use of public school buildings, which usually results in the original public school becoming squeezed for resources and makes them more likely to do poorly on standardized tests. And last year, the UFT leadership agreed to a deal with the DoE that uses standardized test score as 20% – 40% of a teacher’s annual evaluation – with the added caveat that if these test scores are deemed low enough to rate a teacher as “ineffective,” this trumps all other parts of the evaluation and the teacher automatically receives an “ineffective” rating – illogically proclaiming that this meant the new system took more power away from the subjective assessments of principals and was therefore a victory. The raises were deceptively described as “generous,” at 18%. However, there were quite a few issues. One was that the contract is 9-years long, which means that the raises will average 2% a year. This number does not even keep up with the headline rate of inflation, which is significantly less than the actual rise in the cost of living experienced by most working people in New York. In addition, whereas back pay is normally given in a lump sum upon contract ratification, Mulgrew and de Blasio insisted that this would bankrupt the city, as the money was not available in the labor reserve. No mention was made of the vast amounts of money spent on data analysis, payments to the Pearson test making company, and corporate consultants, all of which could be diverted into teacher salaries. The “no money” argument was used to support the back pay and raises owed for prior years being spread out over the course of 7 ½ years. At a deeper level, the whole argument used to justify the lack of real wage increases (i.e. raises above the rate of inflation) which will now be used to justify similar deals with other city unions, rests on a giant lie. Tens of billions of dollars flowed into the coffers of Wall Street banks in the depths of the financial crisis while city services including education were cut to the bone. The number of teachers was allowed to shrink by several thousand even though there were no fewer children in the school system, leading to ever more crowded classrooms. Now, if finance and real estate profits are anything to go by, the city is experiencing a mini-boom. Even a minimal transaction tax on sales of stocks and shares in the city would be sufficient to reverse all the cuts to education and pay for real wage increases for all city workers. The contract also includes several other measures eroding teacher rights. Teachers displaced from “failing” schools closed by the DoE , or ATRs, continue to be rotated, staying at each school for one week, but they are now subject to proceedings to strip them of their licenses and be terminated if two principals report that their behavior is in any way “problematic.” They will then undergo a one-day termination hearing. With the increase in support for charter schools, approved by the UFT leadership, more and more teachers will be displaced and subject to this dangerous, tenure-attacking system. The UFT even agreed to include moves towards further privatization of schools, lauding a clause that creates 200 new “PROSE” schools, in which most union rules can be suspended, including those regarding the length of the school day and year. 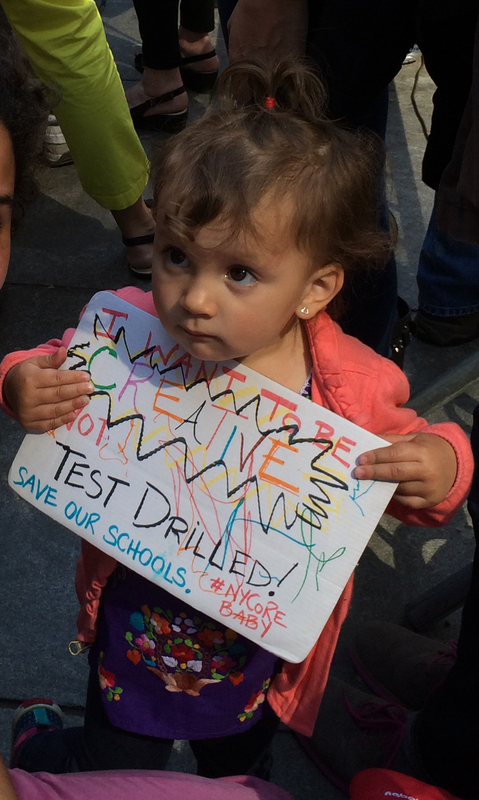 The teachers in these schools will be largely outside union jurisdiction, and there is a very real danger that if the students in these schools get higher standardized test scores, the proposal for the next contract will insist that things like tenure, a reasonable work day, and summer vacations are holding the city’s children back and should be eliminated. In addition, a thinly disguised form of merit pay was introduced, allowing for up to $20,000 to be added to the salaries of teachers who take new “career ladder” positions, one of which is acting as a “peer validator,” a position that asks them to evaluate teachers rated “ineffective” by their principals. This will be even more divisive than other proposed merit pay schemes. What is even more important is what was missing from the contract. Class size was not lowered, and instead of moving towards a reduction in standardized testing, the contract expressly confirms the use of standardized test results as 20% – 40% of a teacher’s rating, an astoundingly hypocritical proposal from a mayor, chancellor, and union president who passionately insist they are against so much standardized testing in schools. For all his talk of inequality, de Blasio presented teachers with a contract that measured them based on test results that are largely tied to levels of poverty in the neighborhoods they serve, effectively denying the fact that inequality in the distribution of New York City’s money and resources has any effect on the educational opportunities of our most vulnerable children. In reality, a huge opportunity was missed to begin a push back against education reform in the biggest city in the U.S. Key to this agenda is “high stakes” testing, which has been used as a battering ram to close schools, open charter schools and tie teacher pay and evaluations to allegedly objective “performance”. Education reform backed by billionaires like Bill Gates and the Waltons (owners of Walmart) has strong support from both Democrats and Republicans. Union leaders like Mulgrew said it would not be right to put too much pressure on “friends” like de Blasio. But the absolute opposite was true. For many reasons, de Blasio wanted to make a popular deal. If the membership had been mobilized to push for real measures to move away from high stakes testing as well as real wage increases, this could have resonated with the public and other city workers and forced de Blasio’s hand. Since the union leadership has utterly failed to take the lead in fighting high stakes testing, it has been left to a grassroots movement, led by parents and rank and file teachers, with the support of some school principals, to take action. Referred to as the “Opt-Out Movement,” it involves parents instructing their children to decline to take the test while sending them to school with a letter stating their refusal to allow their children to be subjected to three days of 90-minute tests in English and Math. Alternatively, some school staffs and principals have decided to refuse to administer the tests due to widespread opposition from parents. It is criminal that the union leadership has refused to come out and support this movement which could develop in the coming years into a serious challenge to education reform. 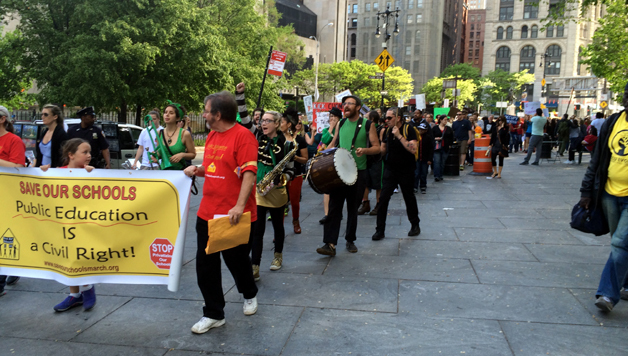 This contract does not only affect the New York City’s teachers. Due to the de facto system of pattern bargaining, which is what made the 4% raises for the first two years of the retroactive contract (as that is what other municipal labor unions were given), there will be the expectation that all other municipal labor unions negotiating a retroactive contract will be offered the same raises as the UFT (0% for 2011-12, then for each of the next school years: 0%, 1%, 1%, 1%, 1%) as part of pattern bargaining. It remains to be seen if other unions, like that of the NYPD, FDNY, and Department of Sanitation will accept this kind of austerity measure. Regardless, the ratification of this contract is disastrous for the system of pattern bargaining, which has been the one way in which New York City unions have shown a measure of solidarity with each other, threatening to turn worker against worker at the very time we should be unifying to form a true fightback. Already, New York City’s Health and Hospitals Corporation members of Chapter 1199 of the SEIU have been offered a contract with the same delayed implementation of raises, 1% raises for each of several years covered by the contract, and the threat of paying into healthcare down the road (nyc.gov 25 June 2014). The leaderships of municipal labor unions, not only in New York, but around the entire United States, put all of their faith in the Democratic Party, even after these politicians establish a pattern of consistently breaking promises and forcing austerity measures onto the working class of our cities, insisting that we need to “be realistic.” Because the memberships of these unions are constantly being told how much worse our situation could be, it is very difficult for most of us to envision how much better it could be if public sector workers showed real solidarity with each other at all times, realized our strength as the people who make cities run, and demanded real wage increases and the restoration of the massive cuts to social services that were designed to make working people pay for the crisis of capitalism. We must also start running our own working-class, independent political candidates for office if the municipal labor unions of New York City and the entire U.S. if we are to have a chance of pushing back against anti-worker, anti-union policies. While the new teachers’ contract in New York City is a real setback, it is not the end of the struggle to defend public education or public sector trade unionism. Teachers, parents and students must unite to demand an end to high stakes testing and a massive investment in education to radically reduce class size. Further provocations from corporate America and its political minions like the new wave of lawsuits aimed at eliminating teacher tenure will inevitably provoke resistance. Furthermore, the struggles of other workers, including fast food workers and the fight for a $15 minimum wage, can lift the sights of demoralized sections of the unionized workforce and show them that the road of struggle and a split from the Democratic Party in favor of running workers’ candidates are the only ways to defend past gains and secure real gains in the future. Without this the very existence of public sector unionism in the form in which it has existed will be in jeopardy.